Women’s Volleyball: Brown tops Hartford 3-0. STORRS, CT- In their last matches of the Toyota Classic, Hartford took on Brown. With both teams without a win so far, one was guaranteed a victory on their way out the door. The win would go to Brown as the Bears picked up a three set victory, though Hartford gave them a very tough match. Set 1 would be the first of the tournament to go beyond 25 points as the two teams kept within 2 of each other in the closing rallies. Eventually the score would reach 27-27 before Brown picked up two quick points for the 29-27 set win. As always with recaps I tend to focus on the offensive, as it is hard enough to follow the fast paced action, but this is not to in any way downgrade the importance of key sets and key defensive plays. I do note defensive saves whenever I have time to write them down. Highlights of Brown’s set, included a cross court attack just in bounds by Brianna Williamson, a service ace by Alexandra Rieckhoff later on, Jackie Feiler spiking the ball of the blockers, Rieckhoff turning as she put one over, Emma Pastore’s kill off the block, followed immediately by Williamson’s kill as well, and during a brown come back, Post and Danielle Vaughan teamed up on a block, and Post let lose a blast through the opposing block. Later Rieckhoff scored another point, and Pastore’s kill tied the game at 21. Vaughan and Rieckhoff added to Brown’s prolific blocking in the set. Williamson came up with a big spike to tie the game at 25, and soon afterward Feiler struck again. Post and Feiler also teamed up for the block to put them within 1 and one point later it was done. Hartford’s highlights included more defensive saves by Danielle Etta, Lindsay Swan landed a kill just in bounds, and Kami Nethersole came up with a great diving save on the ensuing play though Brown still ended up with a point. Sydney Scott took a set and smashed it home for a kill. Later on, Lindsay Ford added a kill as well and would add another one soon after. Nethersole typhooned a shot in on the defense, and added a spike immediately on the next point, as well as shared a block with Swan. Swan picked up a point as well. Later in the set Michelle Cordell added a kill, and Ford did a couple points after that. Nethersole slammed the ball into a gap, and later picked up another kill. She had another good save on the ensuing rally. Scott and Cordell teamed up on a block for what would be Hartford’s last point of the set. Set 2 was also a close one, though Brown did eventually pull away to a 25-21 win in the set. For the Bears, some of the scoring included a cross court blast from Williamson, service ace from Carly Cotton, a block from Vaughan, a block from Post and Kathryn Glickman, another block from Vaughan and Rieckhoff, a kill from Vaughan, and a few from post, before she also served up a service ac. It was Glickman who had the kill that wrapped up the set as well. Hartford’s highlights included Scott continuing her scoring ways, and teaming up with Nethersole on a block, and then with Ford right after that. Nethersole picked up a kill later on, and a few more as the set continued. Dionna Kirton tapped the ball over for Hartford’s twentieth point as well. Scott and Kirton then shared a block for the last Hawks point of the set. Vaughan opened the scoring for Brown with her kill, and Pastore was right after that with a kill of her own, Vaughan struck again, and a play later a Bear backhanded the ball over the net successfully for another point. Glickman spiked into a gap, and later found a hole to tap a ball into. 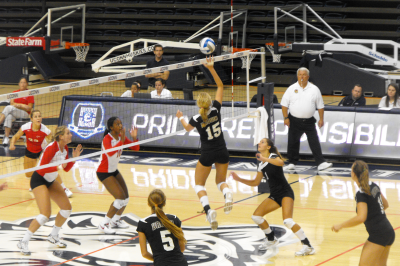 She shared a block with Pastore, then Vaughan and Rieckhoff picked up a block as well. Rieckhoff would later send a kill through a gap, and Amanda Nickel added a point son afterward. Post unleashed a thunderous spike, and Nickel struck again too. Brown kept up the pressure including Post finding a spot just in play to land the ball, Glickman added another tap, Post served up an Ace, and Vaughan closed the match with a blast. Hartford’s highlights included Nethersole scored early, as did Swan. Etta picked up a good D save that led to a point for the Hawks eventually. Ford got in on the action mid-set, and Nethersole threaded the ball cross court. Swan added a kill off the D, and Lindsay Makowicki scored a kill late. She would add a diagonal kill, and Dionna Kirton served up an Ace during the last Hawks run as well. Brown picked up a win in the tourney, though the Hawks did have their closest scoring match of the three. Women’s Volleyball: SIU picks up win over host UConn 3-0.